The pictures above and below are single rows, with shadows from a low sun. 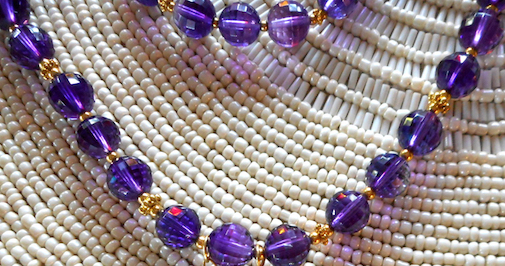 Because of its purple color, amethyst has a long history as a royal stone, dating as far back as 2500 B.C. in Minoan Greece. 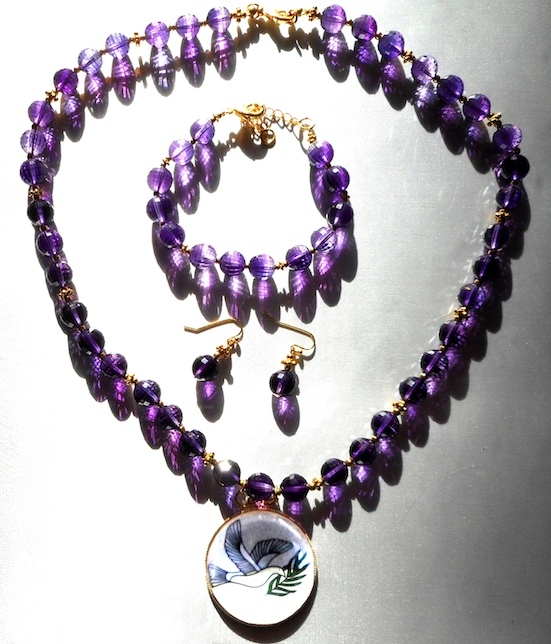 Egyptian pharaohs adorned their tombs with amethyst and the British Crown Jewels feature amethysts. Russian empress Catherine the Great loved amethyst and sent thousands of miners to Siberia to find it. Romans thought Cleopatra’s amethyst ring helped her capture the hearts of both Julius Caesar and Marc Anthony, so many Roman women started wearing amethyst to keep their husbands faithful. 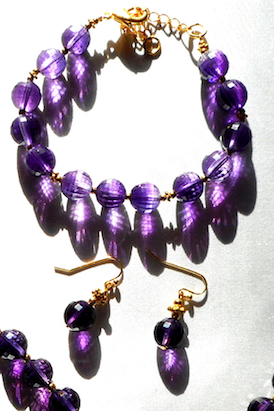 Because of its color, the ancient Greeks associated amethyst with Bacchus, the god of wine. They thought if you wore or held amethyst, you could drink all night and remain sober. The word dates back to the Greek amethystus, meaning not drunk. Many ancient cultures used amethyst in magical protective amulets, believing it could ward off demons, witchcraft, and black magic, calm emotions, eliminate sorrow, grief, and evil or violent thoughts, and protect against harm, sickness, thieves, injuries in battle, and danger. They associated amethyst with healing, happiness, hope, courage, intelligence, wisdom, and spiritual uplift, bringing one closer to the divine. Many believed amethyst could assist prophecy or bring wealth or success. 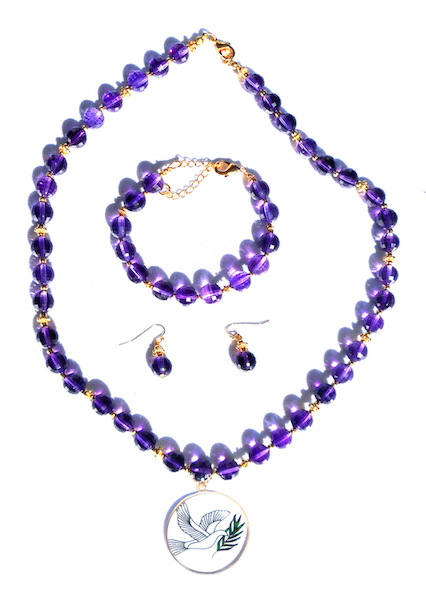 Religious jewelry often features amethyst. 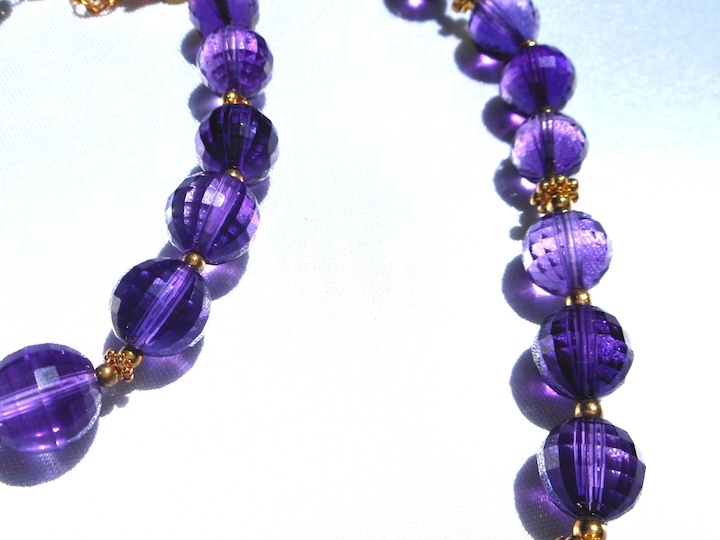 Ancient Egyptians considered their amethyst amulets both protection and a form of prayer. The Egyptian Book of the Dead describes carving amethyst into amulets in the shape of a heart for burial. 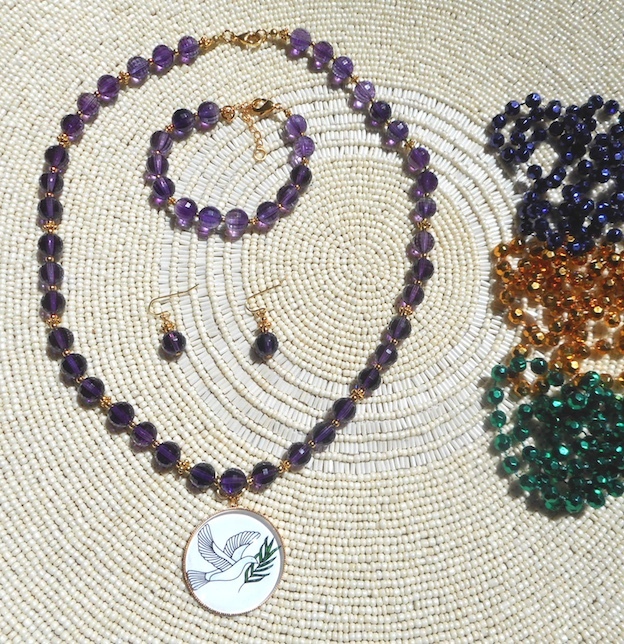 Eastern cultures used amethyst in temple offerings and described it in visions of sacred gem cities and trees of life. Tibetans consider amethyst sacred to the Buddha and associate it with celibacy. In Feng Shui, amethyst heals by absorbing negative energy. 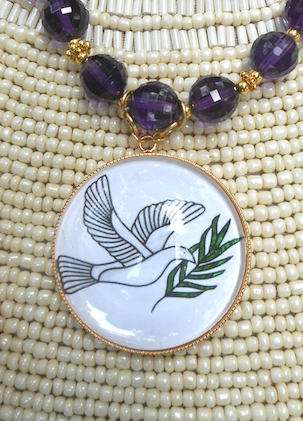 Amethyst appears in the Bible a number of times and Christians often decorated crosses with it. Early Christians associated the color of amethyst with the wounds of Christ and the royal stone with Christ himself, purity, celibacy, and the Apostles. Believing amethyst promoted mental peace, pious calm, or meditation, Christians, including the crusaders, often used it in their rosaries and Buddhists often used it in their prayer beads. Amethyst is sometimes called the “Pope Stone” and Catholic bishops and cardinals still wear amethyst rings today during religious ceremonies. Leonardo Da Vinci wrote that amethyst could eliminate evil thoughts and quicken intelligence. In the 1750s, Italian physician and author Camillus Leonardus said amethyst gives good understanding, represses evil thoughts, makes it easy to capture wild birds and beasts, and helps soldiers win victory. New Agers believe amethyst is a stone of peace and contentment, stimulating the chakras, healing mind, body, and spirit, and bringing tranquility, mental focus, and creativity. New Agers often recommend it for stress, depression, recovery from addictions, nightmares, insomnia, lucid dreaming, or fighting children or warring relatives. Many psychics keep amethyst with their tarot cards and other prophetic tools. In yoga, it deepens spiritual awareness. People often wear amethyst during meditation or place it on their altars to enhance their spiritual or contemplative work. In ancient days, pearls were the most expensive jewelry in the world, linked to the goddess of love (Aphrodite in Greece and Venus in Rome) and referenced in the sacred books of many religions. The ancient Greeks believed lightning striking the sea resulted in a pearl. The Persians and Hindus thought drops of the moon fallen into the sea resulted in pearls. 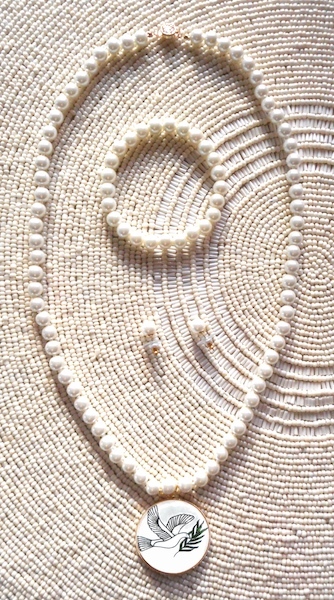 The richest people used pearls in jewelry and even twisted them into their hair, had them sewn them onto their gowns or turbans, and used them to decorate book covers, royal caskets, and religious relics. Legend says Cleopatra showed her love for Mark Antony by dissolving a large pearl into a glass of wine and drinking it. Legend says Julius Caesar loved pearls so much he invaded England, in part, for its pearls. Legend also says Chief Powhatan wore a raccoon cloak and long strings of pearls when his daughter Pocahontas stopped him from executing John Smith. The Roman general Vitellius financed an entire military campaign by selling just one of his mother’s pearl earrings. In the early 1900s, the jeweler Pierre Cartier bought a splendid six-story building on Fifth Avenue in New York by trading it for a two-strand pearl necklace. In the 1800s and 1900s, the pearl trade devastated the world’s pearl oyster beds. Now these beds are very rare. Europeans lusting for pearls often turned local fishermen into slaves. The best pearl divers could stay down for two or three minutes, but many pearl divers drowned. Opening oysters for the rare saltwater pearls kills them, whether they have pearls inside or not. 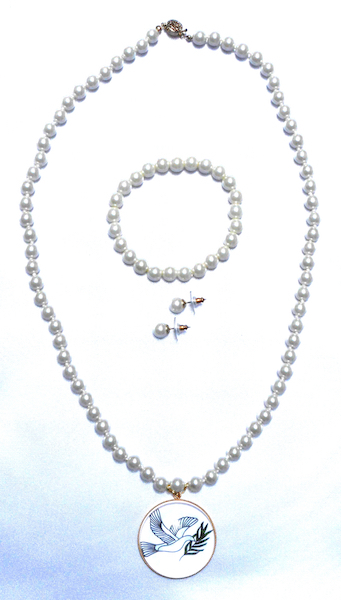 Imitation pearls are completely man-made, so they don’t interfere with marine environments. Romans created imitation pearls with alabaster. In the 1400s, Venetian pearl sellers became so upset over imitation pearls, they made producing them illegal, punishable by cutting off the maker’s right hand and banishment from the land for 10 years. 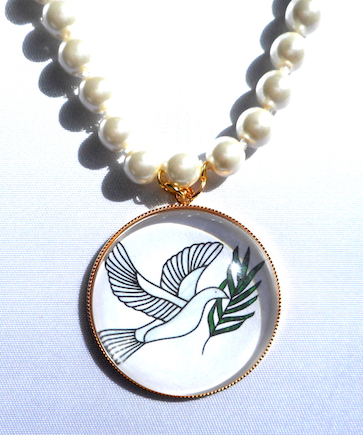 We created this limited edition by adding our dove-of-peace pendant to the finest quality handmade imitation pearl necklace, bracelet, and earrings from Carolee, the international jewelry company famous for pearl and sterling silver creations. High-end fashion lines like Lauren by Ralph Lauren, ABS by Allen Schwartz, Adrienne Vittadini, and high-end stores worldwide like Bloomingdale’s, Nordstrom, Brook Brothers, and England’s John Lewis feature Carolee jewelry. Carolee glass imitation pearls are covered with many layers of natural organic pearl essence, sealed, and polished by hand to create the high luster and iridescence of natural pearls. The Parisian rosary-maker M. Jacquin discovered this time-honored technique in the late 1600s and the Italian glass masters of Murano practiced it in the 1800s. Queen Elizabeth I (known as the Pearl Queen), the British royal family, Coco Chanel, Jackie Kennedy Onassis, and Barbara Bush all wore imitation pearls. We need a few more pictures to show our amethyst jewelry because the look of translucent gems varies greatly in different lighting. 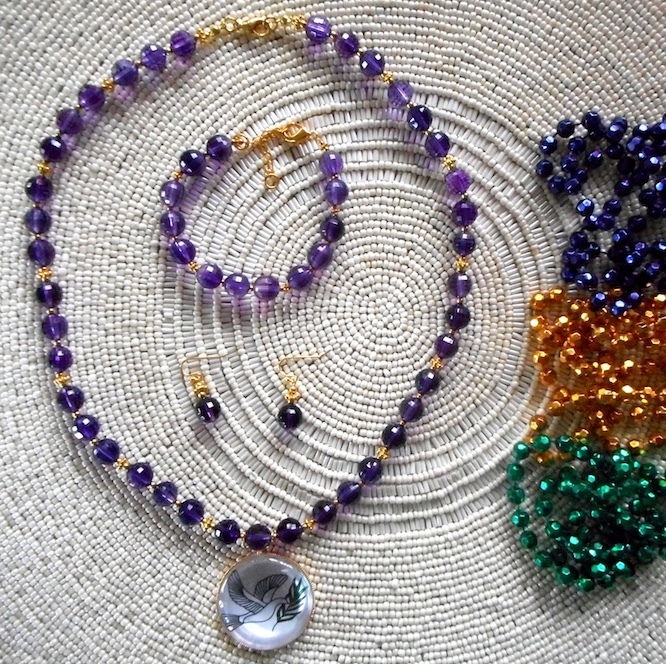 We don’t want anyone to be disappointed, so we have added dark purple, green, and gold Mardi Gras beads to help show by contrast the true varying shades of the natural amethyst.